The ability to block incoming calls on the iPhone is missing on older versions of iOS, and though new versions of iOS can block calls, older devices are left withthe Do Not Disturb feature. Do Not Disturb is excellent, but it’s not really blocking unwanted calls, it just sets a time period where any calls won’t bother you. 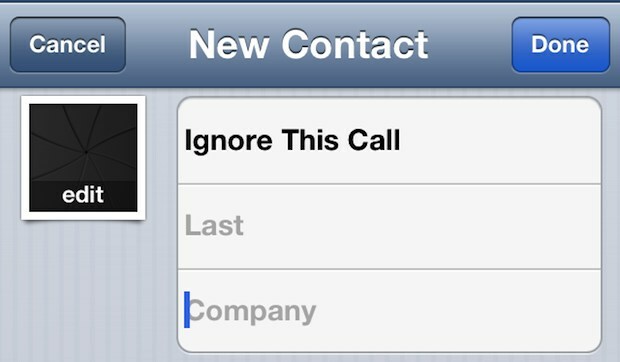 So what can you do if you want to actually block a phone call on the iPhone? You have a few options. You can attempt to contact your cellular carrier and request a specific number be blocked, but not all carriers support that option and you’ll be spending plenty of time on hold and bouncing around tech support menus to even find out if it’s possible. That’s not really viable for evryone though, which leaves a few iOS features as the next best thing, allowing you to create your very own do-it-yourself “block” list of sorts that is centralized and configured to be easily ignorable and also easy to add to. Though it may seem completely counterintuitive to create a contact for the people or numbers you don’t want to accept calls from, it’s necessary if you want to ignore those numbers by way of software. Now that you have the “Ignore” contact created, we’ll disable every alert sound, tone, and vibration for the contact, causing each number within that list to fall silent. Having a centralized “block” contact like this is also far more preferable to creating a bunch of different contacts for all numbers you want to ignore, because it will keep your address book clean and you only have to adjust the alert settings once. Keep in mind that inbound calls and texts from these numbers are still going to come through to the phone, they just won’t alert you or bother you in any way, making them easy to ignore. This is very much a workaround obviously, but until a true block feature is either implemented at the iOS level or universally allowed from cell providers, it’s really the only choice we have. Again, all modern versions of iOS support contact blocking natively so you won’t need to do use this list method, but for older devices, the block list works just fine. You can if you download youmail app http://www.youmail.com Best app ever! I really don’t know why you can’t block calls on an iPhone. Prior to the smartphone era, I had three Samsung ‘slide-up’ phones, first the D500, then the D900 then the G600. All of these had the block calls (and texts) built right into the handset software. It was 2005 I got the D500. Look how things have moved on since then! I have Samsung galaxy blaze and call blocking is still a built in feature. Samsung have signed up to an anti-bullying pledge which sees them add this feature as default. But I use Google Voice with my iPhone, which does allow me to block phone numbers that I choose to ignore. Google voice also allows me to selectively route specific callers to voicemail when the rest will ring my phone. Thanks for this tip! I just finished letting AT&T know how disappointed I was that I’d have to pay extra to safeguard my privacy. Meanwhile, GV just gives them the ‘this # is no longer in service” spiel. Nice! Will this approach work with incoming “blocked” calls where the caller has blocked its number? Same question re: “Unknown” callers. Simple: just don’t answer blocked calls. Nope, and you can blame the phone companies for that. And why they don’t have a simple blocked calling feature in general. Why? Because more phone calls to your cellular plan means more minutes used means more money. It’s that simple. Well, this seems to be only in US + some other country. In many countries only the caller is paying. AT&T does offer a blocking service for $5 for up to 30 numbers: http://www.att.net/smartcontrols-WirelessParentalControls. The caller just gets a recording and can’t get thru. What about blocking txts? I have my txt display when phone is locked, easier to read a txt, but is there a way to not allow certain txts to be displayed? Download a Silent Ring ringtone, assign it to “Ignore This Call” and then you won’t even know they call! I am a Sprint customer and have an iPhone. I have been receiving unsolicited calls several times a day every day of the week (recently the frequency has been increasing) and I was about to tear my hair out. I never answer the calls – this does deter them for a while – but then they start over again from a different number. Finally found that Sprint offers their customers a block call function – just go to your my accounts and then to preferences and you’ll see an option to block voice calls. I input all the numbers I have received unwanted calls from in the past and I am now experiencing blessed silence for the first time in months. Oh and not to be negative but you need to remember that the scammers are everywhere and they are never going to quit. Thank you Sprint! This isn’t blocking a call! the phone still rings you just cant hear it. 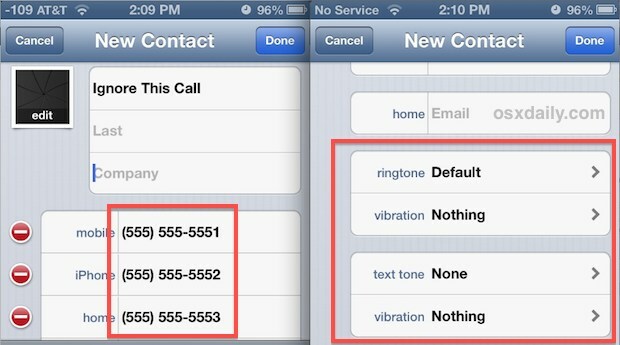 an easier method is to create groups at icloud.com and set ‘do not disturb’ – allow calls from. it is crazy that the iPhone doesn’t have this feature. i remember being able to do this on the Nokia over 10 years ago. Is this blocking for Iphone only or for all phone like Samsung? I don’t have any problems blocking numbers on my iphone 5. Theresa you was absolutely right! Duh!! Lol….THANKS A BUNCH!! How do you block a call that comes across as ” Unknown?” No number at all?